The Last Fiesta follows four school friends’ hedonistic journey through the stunning Basque country, ending in Pamplona, for the running of the bulls. Under the blistering Spanish sun, dark truths from the past emerge, and dreadful revelations entwine their lives in a way that will ultimately lead to disaster. On leaving university Andy Rumbold spent four and a half years in northern Spain. He is now back in England, teaching English and Spanish at a school in Surrey, and working on his second novel. He travels when he can, nowadays mainly to Colombia, where his wife's family live. I loved this well written, very descriptive book. Exhilarating and a beautifully written novel. An enjoybale read. I could really connect with all of the settings and was kept gripped until the final pages. This was a brilliant book. The characters were very interesting. The atmosphere in Pamplona was so realistic I thought I was there. I couldn`t put the book down I just wanted to keep reading it. This is a brilliant, well written book. Read this fantastic book in 3 hours. Couldn't put it down! Well done, Andy! The author obviously knew the area in which the book is set and the details do help to put you there with the characters and I could feel the hot stifling wind only relieved by more alcohol. The mounting tension between the characters grew with the heat so that I had to keep reading . A few loose ends, but a good read. A very enjoyable read! Would like to pay a visit to the parts of Spain mentioned in the story. A wonderful read. Having finished it I am starting all over again to enjoy a second time. this is the perfect book to bring heat to cold days in England! A very exciting story with beautifully drawn characters and a totally unexpected twist. Great debut novel- I couldn't put it down! Gripping Novel-couldn't put it down!! The Last Fiesta is a truly gripping novel with a twist. Its full of wonderful, descriptive narrative and has certainly inspired me to visit that area of Northern Spain. I really couldn't put it down-the sign of a good book!" I thoroughly enjoyed this debut novel! I was recommended this book and thank goodness I was! A great read, I loved the Spanish flavour and the intricacies of the characters and did not foresee the climax of the book. Superb debut novel. Can't wait for his next one! Loved this book. A great read from beginning to end. We need more books from this author! I love you the suspense and drama! The Last Fiesta The Journey of School Friends throught North of Spain, its countryside, bars, running of the the Bulls. Excellent Novel !!!! I highly recommended!! A fantastic book, reading it is like been transported to the warm of the Spanish cities and round a welcome people, I did enjoy it very much and can't wait for the next book from the Author. Loved this book - first to last page in a weekend. THE LAST FIESTA is an established debut novel steeped in Spanish heat. It follows a group of estranged school friends, now in their late twenties, as they travel to the fiestas of San Fermin and the iconic bull run. The journey reveals truths, lies, love and loss as each character learns that they need to let go of the past. Rumbold writes his characters with precision and intricate detail and the reader is swept into the beautiful Spanish hills as they see relationships unravel over the course of a single week and culminate in disaster. 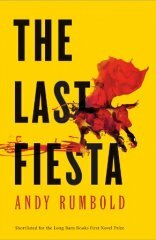 With flashes into a shared past rife with secrets and half truths,THE LAST FIESTA is certainly not a book to miss. In the footsteps of "Papa". A brilliant book which keeps the reader's attention through a range of suspense and involvement with the setting as well as believable characters and actions. Beautiful and vivid descriptions of the Spanish landscape. The characters were very well drawn and the story led relentlessly to the streets of Pamplona. Great 1st novel - looking forward to his second! A great first book by this author. He captures the complexities of schoolboy friendships through to adulthood perfectly and develops the individual personalities of the characters so well as the book progresses. This book really deserves the recognition it is receiving and would be a well-deserved winner. This was an amazing book and it was hard to believe it was the first book by an author. Andy Rumbold takes the readers on a real journey through Spain and as you read the book there is an impending sense of darkness which continues building until the climax. I can't wait to read his second book. The reader discovers the individual personalities of the characters layer by layer while being transportedby the powerful descriptions of the dramatic landscape of the Basque country.